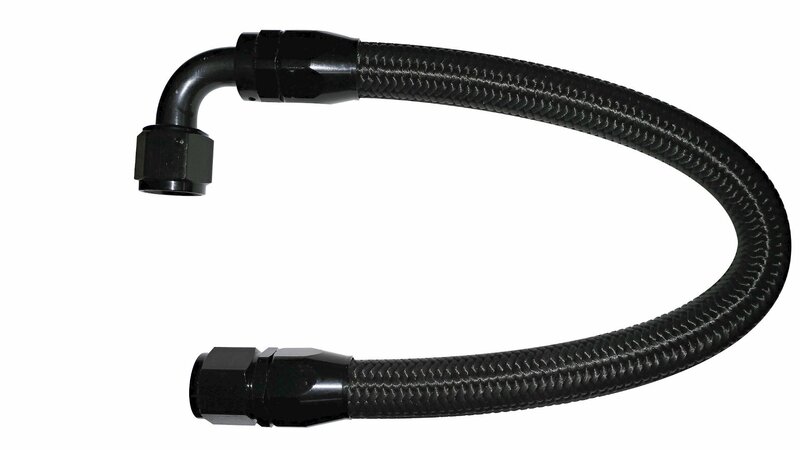 The New Motorsport Diesel Coolant Bypass kit, is efficient, compact and light weight. The flow control valve is now conveniently located into the riser. This new design will now clear virtually all turbocharger configurations. It will also work on 2nd gen and newer applications. Coolant pressures can exceed 90 psi in the rear of the block, this kit ensures excess pressure is allowed to circulate, aiding cooling in the rear cylinders. 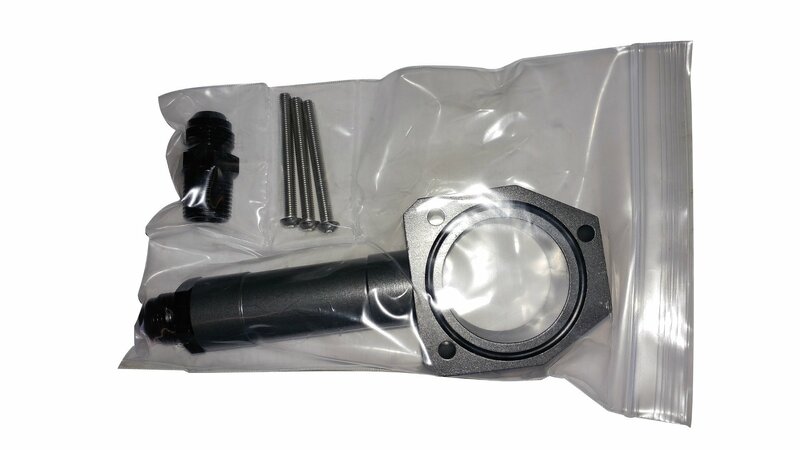 This kit will also reduce parastitic power losses from the water pump, to increase performance. The kit features billet aluminum construction and includes braided lines, AN fittings, and stainless steel hardware. 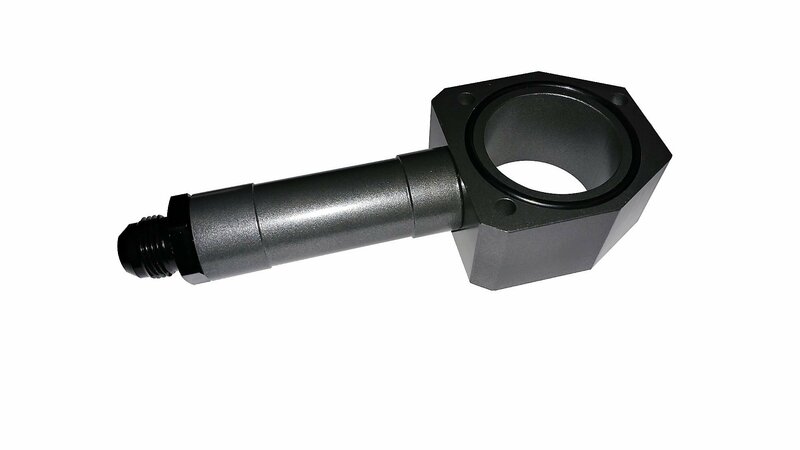 A pressure relief valve is the heart of this system, without this key component your engine will not achieve proper operating temperature, which can cause added cylinder wear due to loss of thermal expansion in the cylinder bores of the engine block. 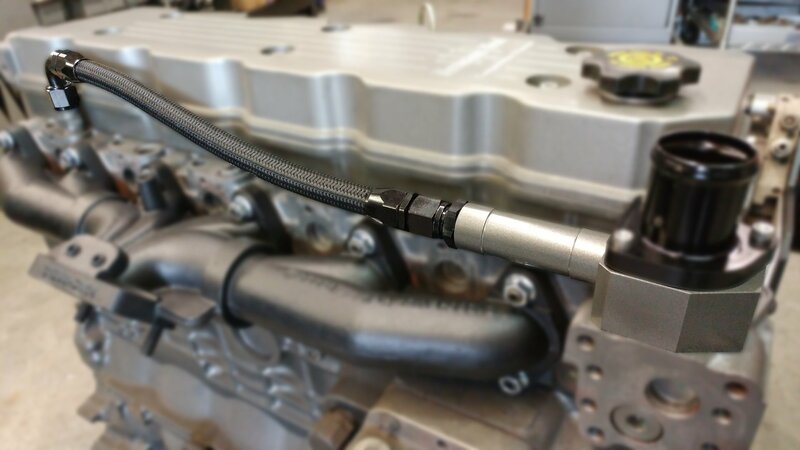 Once the coolant circulating pressure (not coolant expansion pressure) reaches a certain level, the valve automatically opens allowing the hotter coolant to be routed back to the radiator. A pressure valve has attributes that a thermostat cannot provide, the valve operates based upon pressure instead of temperature. The valve also regulates flow based upon demand. The greater the the restriction, the greater the valve opens. A thermostat is either open or closed, no flow or full flow based upon the flow area. With a thermostat, it will have to be in the open position to offer any flow advantage. A thermostat can stick in either the open or closed position. With our design, installation is a breeze. It can easily be installed in less than 30 minutes, this is a install it and forget it part. The systems installed height does not promote a void for air entrapment, as the components do not elevate above the highest point in the coolant system. Although this kit has been proven effective, combustion leaks into the coolant system can still over pressurize the rear freeze plug, as the MLS head gasket can leak and reseal with no visible indication of a prior leak. Kit will work on trucks with deleted EGR. Your kit is one of the best investments I’ve added to my truck since I started upgrading it. I stuffed some 100% industrial injection sticks and an S369sxe charger in my 6.7 and popped a freeze plug the next day. I installed a new one, and not a week later did it again. I was hipped to your kit by my Uncle and laughed at him. He actually ended up purchasing it for me and had it installed while I was overseas. The freeze plugs haven’t moved since, and I run the truck very hard. I tow several days a week now and your kit keeps my coolant temps within 10° under any driving/weather condition. I’ve been very impressed with how well and simple it’s designed. So, thank you.